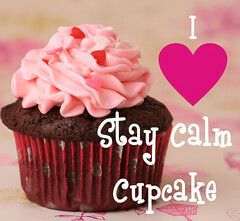 About | Stay Calm, Have A Cupcake! I can best describe myself by using one of my favorite quotes from Audrey Hepburn. I am in my mid 20’s and have realized now, more than ever, that it’s the little things in life that make me happy. A rainy afternoon when I can take a nap, a new set of frosting tips, a delicious new recipe, a day by the pool , or a laugh with great friends. My life is full of little moments that make me realize just how content I can be with a cupcake in my hand and the person I love sitting next to me. In my world, a sweet treat can fix almost anything! So feel free to comment on my blog, or stop by my shop and order some sweet treats of your own. Connect with me on Facebook, Twitter, YouTube! Great job, Jill! You certainly have both blogging and baking talent! How DO you make the icing swirl up like that?? A special icing gadget? Love, love, love your blog title. Our “abouts” are very simliar! Nice blog. yay you!!!!!! i love cupcakes and i love audrey hepburn… i would love to add you to my bogroll. what do ya think?? Thanks for stopping by! Feel free to add me to your blogroll – enjoy the recipes! I am so glad you found me because I absolutely LOVE your blog. Your blog looks like mine but yours is way BETTER! You should keep doing what you love to do. what a lovely blog u have! thanks for stopping by my blog and leaving ur link! Thanks for visiting my blog…I love yours too, it’s so cute! You’ve got some great cupcake ideas I might have to try. I was just checking out your etsy shop and loving your products! The cupcake kits are a fantastic idea and your decorations are so creative and lovely. If you ever want help spreading the word, I’d be happy to feature your shop on my blog if you’re up for some sort of discount promotion to get more customers. I’m sure my readers would enjoy it! Hey, great stuff! I will definitely check out more. My best friend, treceygjones, and I are some of the top cupcake consumers in the world. I promise you. lol. We heart cupcakes. Cupcakes make me less snarky. 😉 Good luck with everything and I will keep reading! Hey! I saw a blog with ‘cupcake’ in the title and had to check it out 😉 It seems we are both on a similar journey at the moment! I am in the process of starting a cafe and selling cupcakes in the meantime! I will definitely be keeping up with your progress, good luck!